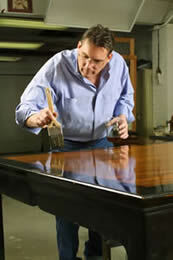 DIY Fine Furniture Finishing and Refinishing Techniques: Faux Finishes, Sponge Painting & Stenciling. Your wood finishes will look deeper and feel smoother. Your painted finishes will glow with more life. You will have more fun with finishing than you have ever had. Really! Hi, my name is David Sorg, your host on these DVD's. Join me as I show you how easy it is to get beautiful results with your projects. I've been a professional finisher for 17 years, as well as an instructor for art schools, finishing seminars, and for individual students. 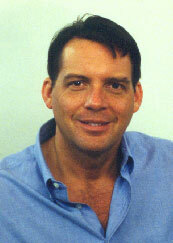 I've also authored several articles for nationally known publications such as Taunton Press' Fine Woodworking magazine. Over the years, I've provided custom finishes for architects and designers that range from private residences to public libraries to casinos; a wide variety of looks and uses that I'd like to share with you. Whether you are a beginner who has wanted to discover the joy of turning a garage-sale bargain into a colorful treasure, or an experienced craftsman finishing a grandchild's future heirloom, I believe that you will enjoy an easy-going style, along with clear explanations and step-by-step demonstrations that will give you the knowledge and ability to achieve spectacular results. Maybe you've thought about earning some extra income from finishing, or you're already a pro. The videos will more than pay for themselves for you. These DVD's are like your own personal class or seminar, detailed and complete. But this class starts and stops whenever you choose, and you don't have to take notes; just go straight to the parts you wish to see again (At $35 for the set, they cost a whole lot less, too!). What makes these videos different from all the others? The biggest single difference is that these give you everything you need to know to get perfect results. You'll get the how-to and the why-to! Have you ever felt that other books, videos or TV shows you've seen left out the important details? Or wondered why your project didn't turn out the way you wanted it to? These DVD's will give you the answers. And here is something you won't find from any other videos or classes: A Perfect Guarantee! The DVD's come with an unconditional money-back guarantee of your satisfaction. If you don't believe that your finishes look and feel better, send them back anytime for an instant refund. I'll even pay your return postage! Please click here to order these videos!